In the beginning, there was nothing. Just the analog mundacity of meatspace - limited communication in a time of limited intelligence. Then came ARPANET, followed by the internet. Soon after that, TimBL created the web. Although still primitive forms of communication, Earth was beginning to open its eyes. Then we erased the line between meatspace and cyberspace, creating The Mesh. The promises of virtual reality, total connectivity and broadband as ubiquitous as air had been fulfilled. Entering a mesh node was as simple as walking through a door. Information was free, Earth was enlightened... or was it? Enter the multi-planetary corporations: The Bank of Solaria, Crabapple, Macrosmauf, Enessai, Moogle... All juggernaughts of power and industry spanning the solar system, inhaling everything and charging a fee to spit it back out. Government is practically non-existent, ceding all power and enforcement to fat corporate contracts. Laws evaporate in favor of EULA's, end-user-license-agreements for everything from driving to eating. Not everyone is content with this arrangement. A few fight against it - they are hackers, crackers, phreakers, runners and ghosts. To the mega-corps these dissidents are agents of chaos, a threat to their business model. An expense that can not be tolerated. 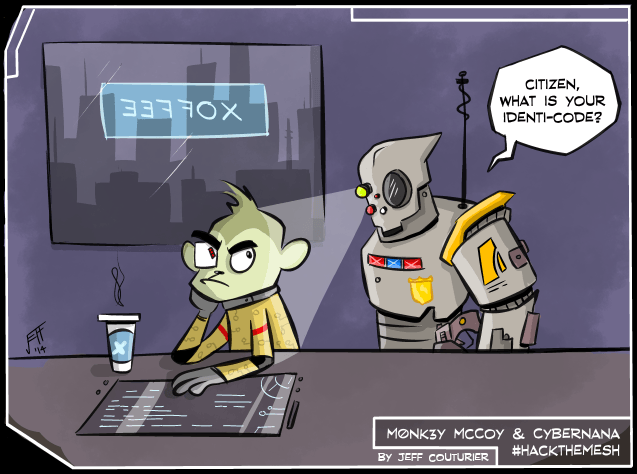 The most notorious of those intolerable expenses is citizen ID 1337-MMY, a.k.a. "M0NK3Y" McCoy. An augmented simian of undetermined lineage. Resident of Novi-Yotta City, freelancer, x0f3 addict, hacker for hire. This is the story of his quest to hack the mesh. A huge thanks to Don Ahé for helping bring this comic to life. Don and I collaborated on the prolog, world-building, story, and art. Definitely check out Don's site and some of the incredible projects he's working on. Read from the beginning, or jump to the latest page. Join the mailing list if you'd like a reminder when new pages are posted.